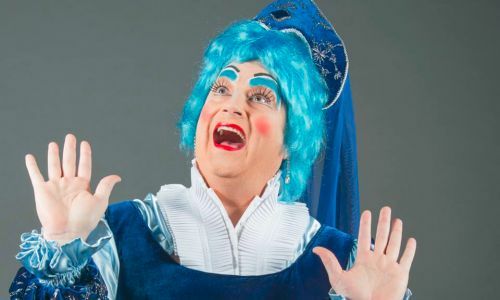 If improv and pantomime had a child, it would be Christmas Queen, an “improv comedy fairytale.” This magical story is brought to life each night through audience suggestions and a spunky narrator, who guides the action as the evil Christmas Queen tries to ruin the holiday for everyone. In true pantomime fashion, the audience is told to boo every time the Queen comes on stage, and the Queen is played by a man. This character, with overly perky fake breasts and classic pantomime makeup, is hilarious on its own. With the addition of the other improvised characters and a crazy plot of random elements, the night is guaranteed to be entertaining. On opening night, the story was set in the town of Florale, where a cat breeder was having trouble getting her cats to mate, a German man was very proud of his borscht, and there were flowers everywhere. The lawn dart toss which kicked off the Christmas season was officiated by the mayor, and romances were blooming. The Christmas Queen, up on her mountain and emulating the Grinch’s bah humbug demeanour, decided that she would ruin Christmas by contaminating the flowers of Florale with Monsanto seeds. The epic battle between the Queen and the townsfolk involved a look back at the Queen’s past attending Avon University. Of course the plot sounds bizarre, but that’s what makes the show so much fun, along with watching the improvisers try to come up with jokes on the spot and make fun of each other and the audience as they perform. Christmas Queen is presented by Vancouver Theatresports from November 19 to December 21. For more information, visit vtsl.com.